John Doub ran 26:42 to out leg David Shafer (27:04) to win the Autumn Leaves 5 Miler held at Mount Saint Mary’s University. Other Steeplechaser notables who finished that day included Dwayne Late (17th), Tim O’Keefe (18th), Joe Myers (24th), Brent Phillips (30th), Chuck Bare (45th), John Godinet (75th), Martha Grib (83rd). George Waxter (101st) and Leslie Nuse (118th). 208 runners finished, with the top 127 finishers all breaking 40:00. David Shafer topped the field in the 11th running of the Forest of Needwood. The former Middletown Track Standout ran 26:45 over the rolling five-mile layout; the majority of the field of 37 finishers were members of the Steeplechasers, including Tim O’Keefe (8th) and Bob Imming (16th). 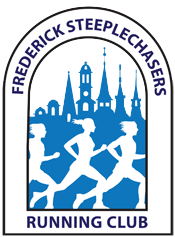 Matthew Adams won the FSK 10K hosted by the Frederick County YMCA covering the course through town in 32:09. 51-year old Ed Busch paced the local contingent finishing 12th in 35:06. Brent Ayer finished 13th and Tim O’Keefe 14th. John Godinet placed 43rd, 63-year old George Waxter finished 57th, and Leslie Nuse was 63rd. 124 runners finished. The American Cancer Society 5K Race was held on the Fourth of July at Baker Park. Chris Neglia out-ran David Shafer and Matt Adams to win in 15:33. The top 18 runners in the field of 263 broke 18:00. 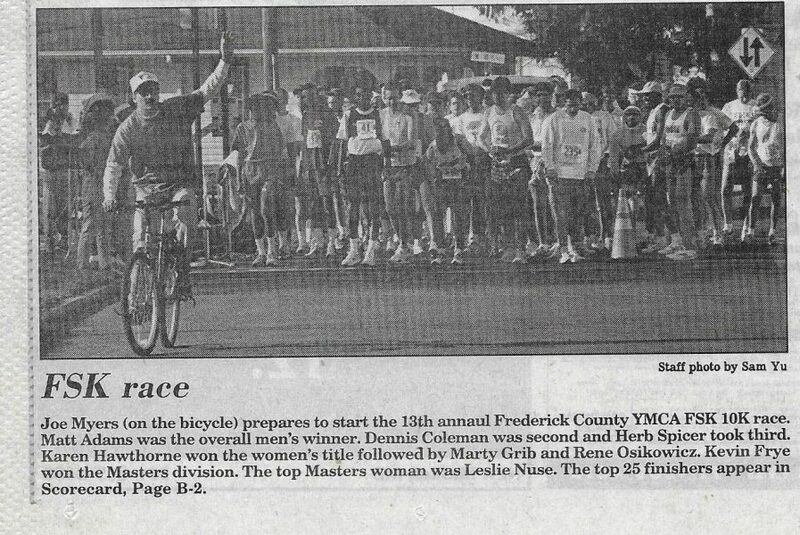 Marti Grib finished as the 10th woman and won the 30-34 age group in 21:32. 40-year old Tim O’Keefe won his age group in 18:10. Matt Adams won the 15th Annual Goodloe Byron Memorial 15K in 53:44. The annual classic honors the late U.S. Congressman who was an avid distance runners and multiple time finisher of the Boston Marathon and the JFK 50-Mile Hike Run. Several family members participated and Geb and Jane Byron finished the run. Rosemary Thomas was the first female finisher in 1:12:23.